*** Sits on fascinating fossilized coral in the heart of West End. *** Flat easy walk to all the action in West End. Dive shops, gift shops, grocery stores, beach bars and great fine dining are just a few minutes away. No steep hills to walk or car required. 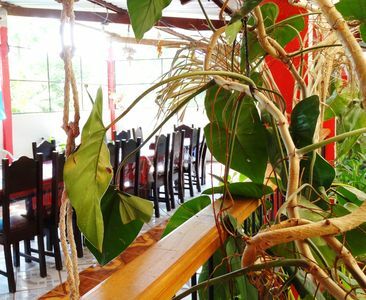 *** Fully staffed and meticulously maintained by the owners and full time staff. 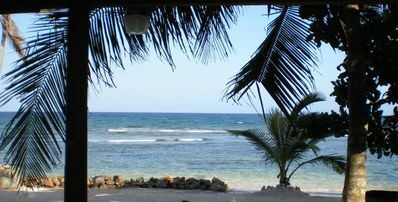 *** Back up batteries, UV filtered water and solar power (power outages are frequent on Roatan). *** Fabulous local expats as our dedicated managers and a full time, year round housekeeper and groundskeeper. *** We do not use a large property manager or try to sell you tours. We recommend activities and business we frequent when on the island. *** We can help with anything your group desires: private chefs, day trips, diving, massages, golf, babysitting, fishing charters, island tours, etc. *** Live like a local in charming West End - Be a traveler not a tourist!!! Avoid the tourist trap of West Bay and remoteness of other properties. Please enquire or give us a call so we can answer all your questions, offer you our best price and help you plan a fantastic trip to the island. 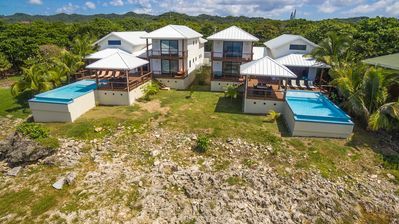 Vivaro Roatan is a collection of purposely designed vacation homes in stunning locations. 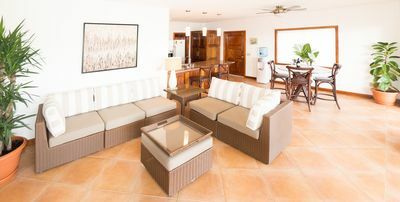 Privately managed and meticulously maintained our properties are at a standard well the above most homes on the island. 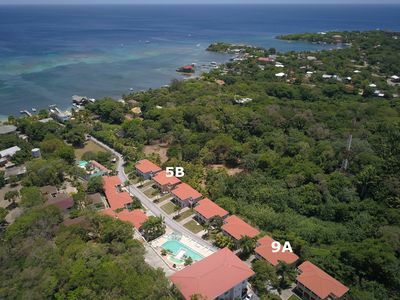 Vivaro Oceanfront is a modern 7,000 square foot luxury estate situated on Roatan’s beautiful west side. West End's premier luxury rental is in an ideal location just minutes from Half Moon Bay. 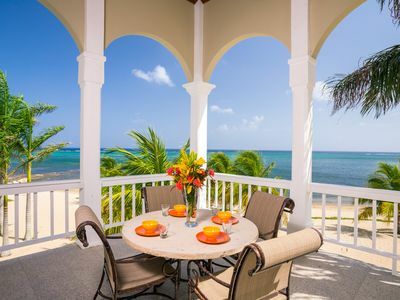 Six bedrooms, eight bathrooms, two large great rooms with Chef's kitchens and spacious decks sit on the stunning iron shore, where the waves of the Carribean Sea lap up onto the shore. The crystal-clear cerulean waters teem with life and offer superb snorkeling through the Meso-American reef below, while the above horizon offers extravagant sunsets night after night. You’ll experience ecstasy as you sit on one of two sprawling decks next to two infinity pools and soak in this paradise. 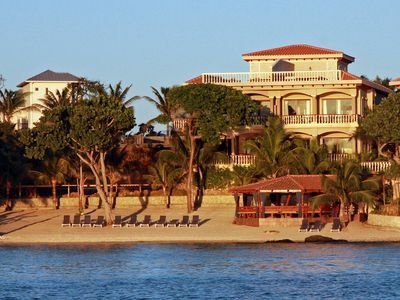 There's simply nothing more luxurious than a home feet from the ocean in paradise to call all your own! 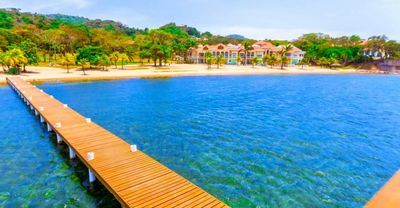 Vivaro - Oceanfront is TRULY a few minute flat walk into the heart of West End - no steep hills (for example, Sunset Villas), no busy street full of cruise shippers no noise pollution from the bars of West End (Coral Vista homes) No rental car needed. The decks and pools are ACTUALLY just feet from the ocean with the most amazing sunsets you have ever seen. This six bedroom oceanfront estate was designed specifically for larger groups to experience a fantastic vacation together while at the same time having lots of space for relaxation. 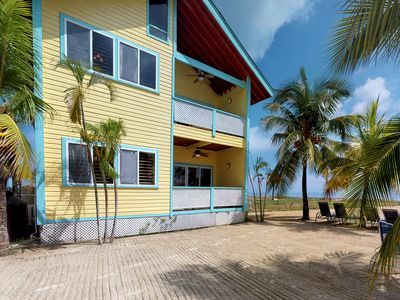 The location near all the action means those who want to dive and enjoy sunset at a local bar will be just happy as those in the group who prefer leisurely days on the deck and floating in the pool just feet from the ocean. 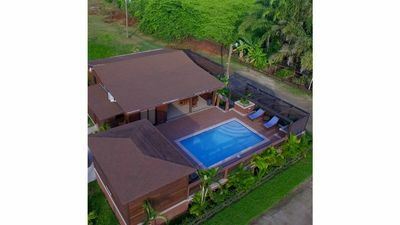 The only private rental in West End and West Bay with two large private pools directly on the ocean, back up power, wifi, cable TV, luxury amenities, and a dedicated manager. 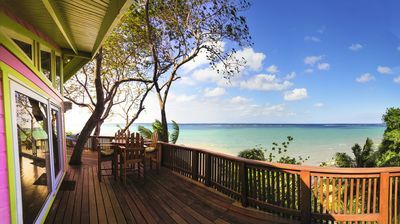 We have skimped on nothing so you can have a fantastic island paradise vacation. 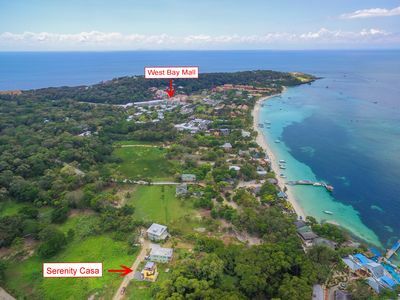 Vivaro - Oceanfront sits on a gated 3/4 acre piece of property in the most peaceful and private area of West End. 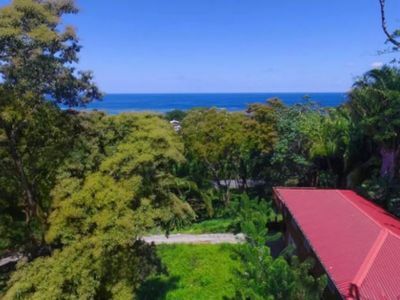 Built right on the iron shore - beautiful fossilized coral, not lava or rocks - this West facing property affords amazing sunset views and sea breezes year round. 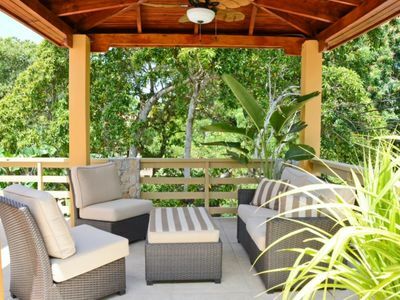 While you might never want to leave the incredible deck, the bars, restaurants, activities and dive shops of West End are just a short walk away. 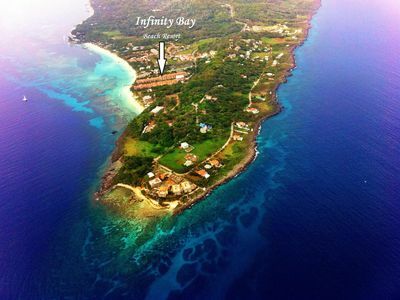 The highlight of the property is the two large infinity edge pools jutting out over the iron shore. The pool is an amazing spot to cool off with magnificent sunsets as a backdrop. The size and position of these pools make them very unique in West End. From your morning coffee on the deck to floating in the creative infinity pool at sunset, there will be days you will not want to leave. The central vaulted great rooms are extremely spacious with large accordion doors that open onto the deck. A large L-shaped couch and dining table that seats at least 12 adds to the functionality of each great room. LED lights highlight the trellised ceiling while six ceiling fans help keep you cool. 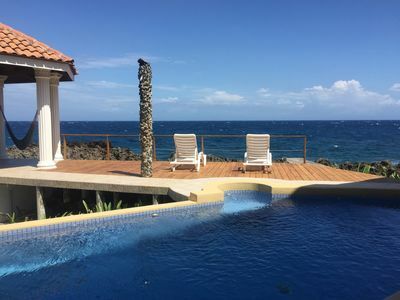 The sprawling outdoor deck space surrounds the infinity pool with a tanning ledge and offers spectacular views of Roatan's fabulous reefs and spectacular sunsets. There is ample furniture, from lounge chairs and sofas, to a large shaded table for all your group to relax, sun, dine, play games, or read. The chef's kitchen features white stone counter tops and dark Honduran wood cabinets. The LG gas cooktop is on a substantial island with seating for six. All appliances are top of the line LG. The double door refrigerator has UV filtered water and an ice maker. The kitchen has been meticulously outfitted with high quality knives, cookware, dishes, silverware, etc. There are 2 master suites - one upstairs and one downstairs in each house. Each master suites faces the ocean and has a large deck. 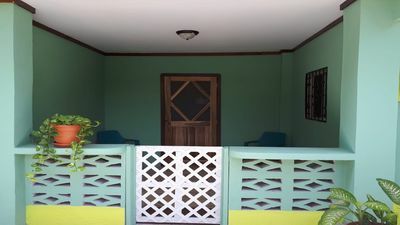 The master bedrooms feature Honduran wood floors, blackout curtains and luxury linens and towels. The large bathrooms with marble counter tops include rainfall shower heads and private toilet rooms. The fifth and sixth bedrooms are large rooms with a loft - perfect for a couple, children or as a family room. These rooms has 24 feet high ceilings. 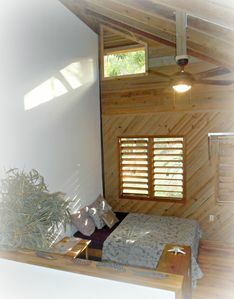 South House features a king bed and a custom triple bunk bed handmade of Honduran hardwood with a full bed on the bottom topped with 2 twin beds. North House features a triple double bunk bed: 2 doubles topped by 4 twins. The large loft area in each house includes a twin trundle bed and lots of pillows to relax or nap. Each room has a bathroom with a rainfall shower and a separate toilet. Kids or adults will love the comfort and spaciousness of this room. Our goal is for Vivaro - Oceanfront to be as energy efficient as possible. Every option from LED lights to energy star rated appliances help to conserve daily usage. 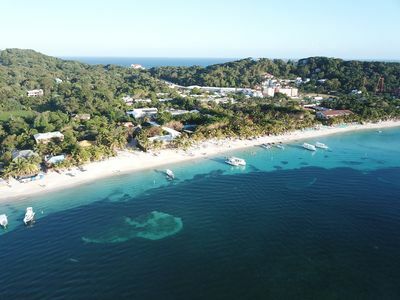 The power on Roatan is propane generated and there are frequent, but brief outages. At Vivaro, because of a backup generator you will barely know when the power goes out. You will have lights, AC, water pressure, and be able to cook. Internet and TV may go down during power outages. There is a charge for your energy usage. We will charge the most recent kilowatt hour charge from our bill for your group's electricity usage. With intelligent and careful use of AC, lights, and fans this charge can be minimal. This means AC only at night or when in the room, AC set at around 22 degrees, lights and fans off when not needed, etc. Energy conservation should always be a goal if you want to minimize your charges. The meter will be read upon check in and again at check out. Charges will be deducted from your security deposit. Charges have ranged from $200 to $800 depending on the renters personal choices. There is a $400 cleaning charge for all groups. This includes light cleaning at least 1 time during your stay and a deep cleaning after your checkout. Sheets and towels will not be changed every day. Water is scarce and conservation required. We expect guests to keep the house and kitchen reasonably clean during their stay. If you desire more frequent cleaning please let us know so we can book a trusted cleaner. 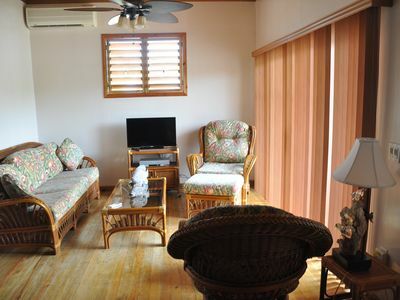 We include transportation from the airport to the house for stays of 5 nights or longer. (One car or van per group. We can help arrange additional cars if needed for a charge. There is an additional $10 fee for the driver to wait for you if you choose to shop at Eldon's.) If you choose to rent cars, we will sent a driver to guide you to the house. We can help you arrange the return trip to the airport and quote you a price. No daytime or evening guests or parties allowed without prior arrangement. Only those listed in the required signed contract and paid for will be allowed at the property. We are open to events. There will be additional event fees. Please inquire.